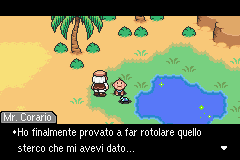 In just the span of a few days, two separate Italian fan translations of MOTHER 3 have been released. The first translation was headed by Snifit, and you can find more info, download information, and such here. Next is a translation by lorenzooone. You can read more about it and download the files here. Since I don’t know Italian I can’t really recommend one over the other from screenshots alone. 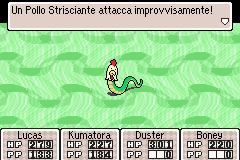 In any case, if you know Italian or are learning Italian and would like to play MOTHER 3, now you have some options to choose from! 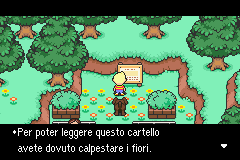 I don’t know the first thing about Italian, but the bottom one seems possibly iffy because the second line of text in the first screenshot is offset a bit to the left… Minor to be sure, but since it’s one of the first lines in the game it doesn’t bode well. Not to mention the weird stretched images. 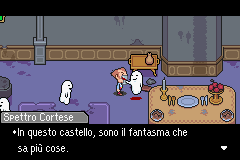 Being Italian, I recommend Snifit’s translation, since lorenzoone’s version is plagued by translation errors and a few bugs. Honestly, I don’t have so many bugs as the snifit version does… send me an image of his Sound Player Menù working after you’ve saved, he didn’t translate all the graphics as I did and we share the other bugs I have are shared between the versions. Ops, typo: and we share the other bugs I have. Please, everyone, let’s not fight about whose translation is better. I’m sure mine has weak points compared to lorenzooone’s, and vice versa. Let people choose freely between the two patches. 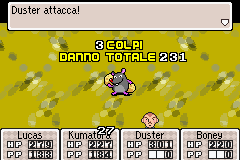 As long as MOTHER 3 becomes more popular among the Italian gaming community than before, I’m happy. However, it’s good that the fact these two projects are separated is clear; it’d be embarassing and confusing if someone experiencing trouble with my translation started bothering lorenzooone reporting mistakes or bugs that don’t exist in his. I’ve questioned Jeffman for a bug that both of us share, I’ll report you his answer (A strange framerate drop that occurs on certain items in various menus). Great job, both of you! You should team up and combine the best elements of both translations! 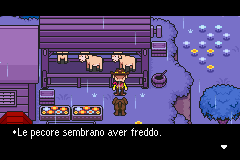 Well, it’s always great to see MOTHER 3 in another language! Expand the global fanbase!! 1- There’s Very Few Arabic-Speaking Fans Of The Series, As The Series Is Unpopular In The WHOLE Middle East. Not Just That, But See What Happens When You Put Spaces Between Each Letter. 2.5- Unlike English And Other Languages That Uses Latin As A Writing System, Arabic Is Written From RIGHT TO LEFT. It Would Be So Hard Translating From Right To Left. God, Even Japanese Is Written From Left To Right. I don’t think that was ‘fighting’. I just expressed my personal opinion. I know firsthand how tough translating is, and I wasn’t trying to detract from lorenzoone’s translation. How on earth did two of these come out at the same time but they’re completely unrelated? Seems like a lot of duplication of effort when people are only going to play one or the other. It’s actually very common in the ROM translation scene. It’s happened to me a few times too. Usually it happens when a team is doing their own thing but don’t want all their hard work to go to waste when they see a separate project making progress, so they speed up their work. Sometimes the other team will respond similarly. @Lorenzooone, I’m not completely sure but I think that the frame rate issue just happens in emulators. I’m playing on real hardware and I didn’t noticed any issue. @Scotty test it by looking in your invenotry at a “Bomba Scattante”. If you’re right, then it’s a great news for both me and he. @CRefice: Sorry, my bad. I perceived the discussion as tense. Given the amount of stuff that’s left to personal taste, it would be incredibly difficult to merge two complete projects as Matt suggested. Also, it’s hard to explain, but with Italian the matter is further complicated. Our language is more sensitive to the order of the words in a sentence, and offers a wider variety of synonyms than English. For example, I’ve translated PK in Psico, ad the ssb4 description of the custom moves suggested, in his version, he mantained PK, I’ve translated Nowher Islands in Isole Altrove (For SSB4 they are Isole Nessun Luogo), while he didn’t translated them, there are a lot of personal choices that changes the translations and this can be a good or a bad thing based on who’s playing it… Degustibus. 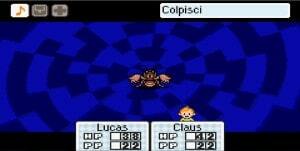 Well, now at least Nintendo’s flagship characters [Mario and Luigi] can play Mother 3. “every single thing in Italian means simply; ‘look at the conductor'”. @GSUser I’m actually planning for an Arabic translation for Mother 3, I even prepared a Mr. Saturn font (but I’m still trying to nail the perfect regular font that fits in 12px yet still looks like the original fonts). As for what you pointed out, the solution would be implementing diactrics so that the vowels are explicit and it’s no longer as ambiguous. The trick being showing them besides the character rather than on top of it. Thing is, I’ll need to learn some ARM assembly so that I invert where the text appears (right-to-left) *and* how the numbers and item name variables appear in the text. And probably the grey box for the NPC names. And last but not least, conjugation rules for battle text (since natural-sounding gender-neutral language doesn’t exist). But I’m already invested atm in a Chrono Trigger translation (sadly handling both hacking and translation), so this one might wait a bit. I already got the M3 inventory started, at least.